Whitby Town will be looking to add more strength in depth and more quality to their ranks as they seek to re-establish themselves as promotion contenders next season. The Blues finished up in 13th spot in the EvoStik League Premier Division, but only guaranteed their top flight survival in their penultimate fixture, after a bad run saw them plummet down the table. Wins in the last two games, against Ashton, who featured in the play-offs, and Kings Lynn, gave the Blues a respectable final position, but they know more faces are needed if they are to do better in a challenging league. 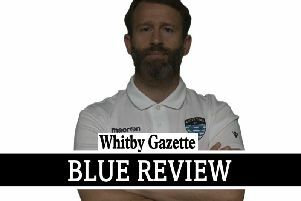 “We have got to build for next season,” boss Darren Williams told the Gazette. “We’re looking to improve the squad in a few areas. “Looking at the season as whole, we have drawn too many games we probably should have gone on to win. “We could have taken another ten points from those draws and that becomes frustrating. Williams said problems like injuries, especially to centre halves, and suspensions had gone against the club at the wrong time. “It’s a small squad so anything like that affects us massively,” he admitted. “If I took a step back, I would say it’s not bad with what we have had to deal with. Williams believes next season’s premier division will be even stronger with the arrival of Darlington 1883 and Salford .